My maternal grandfather bought a dairy farm and converted it into a tree farm in northeast Wisconsin. My wife’s family has a long history of farming in the same region. I would wager a good number of hunters don’t have to climb too many branches on the family tree before they bump into a farmer of one kind or another. According to the US Census Bureau, 150 years ago almost 50 percent of Americans were employed in the field of agriculture. Now that number is less than 2 percent. But that doesn’t mean some of us don’t still have a little farmer in us, yearning to feel the thunder of the tractor as we work the land. I don't think the US Census Bureau factored in those of us who grow food plots as "farmers," though if they had, those numbers may change slightly. I’ve spent a number of summer afternoons atop a vintage Ford 9N tractor prepping small food plots amid the red pines of that same tree farm. Every now and then, I get the faintest whiff of cow manure and I’m reminded of farmers that came before me. Farmers who depended on that same soil to put food on the table and pay the bills. My limited farming experience has been purely recreational, and the ultimate goal was always a lush food plot and venison in the freezer. Luckily my family’s welfare doesn’t depend on my farming skills. While the food plots produced some venison, the hours of preparation, planting and weed control never amounted to anything spectacular in terms of growth. Before I started helping out, my dad grew some pretty impressive turnips and radishes. There are few activities you can participate in nowadays that allow the mind to wander back to times before smartphones, before computers, before automobiles. Sitting around a campfire is one, staring at the flames as they dance among the logs to the beat of the crackling embers. Hiking through an uninhabited wilderness surrounded by flora and fauna that reside unchanged for centuries is another. I would add planting a food plot to that list. While planting crops specifically to attract wildlife for hunting is a relatively new agricultural practice, the art of farming is more than 10,000 years old. It doesn’t take much effort to let the mind wander surrounded by the hum of an engine with the sun on your shoulders and dust in the air. Although modern conveniences such as efficient equipment, soil sample kits and advanced seed mixes are certainly things our ancestors would’ve loved to have, many things about farming haven't changed. For as long as man has used equipment like tractors to till the soil, man has gotten tractors stuck in that same soil. This wannabe farmer didn’t think to detach the disc or shift to a lower gear after burying the tractor in a low spot, but that same lesson had to be learned by farmers of the past as well, or maybe that knowledge was a bit closer to the front of the mind back then. There’s no denying the fact that if food plots didn’t offer some return on investment in the form of improved wildlife habitat or increased hunting success, it wouldn’t be nearly as popular as it is today. In fact, take the habitat and hunting out of food plots and do you know what you’re left with? Yard work. Not nearly as romantic. But I don’t get the same sense of accomplishment from riding a lawn mower as I do that old Ford tractor. Maybe it’s because, way back when, my ancestors didn’t give two hoots about a well-manicured lawn. 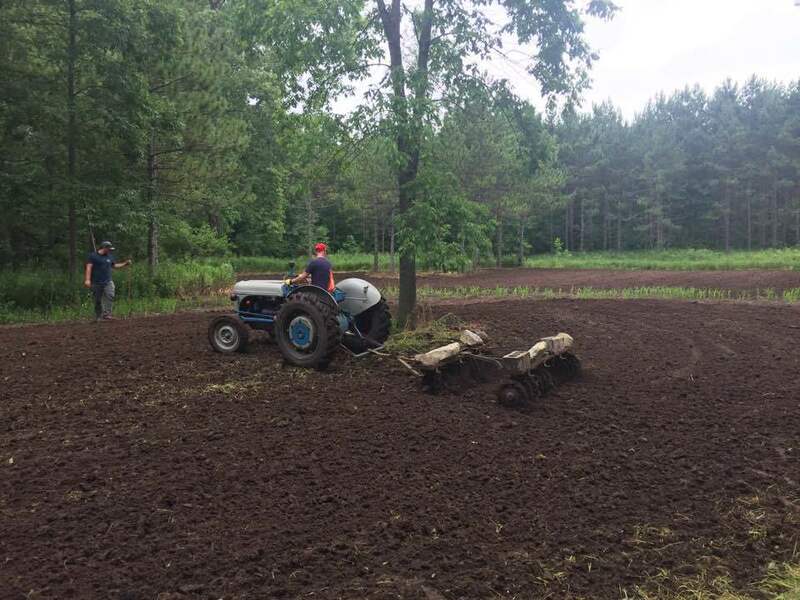 That’s not to say you need to have a tractor to reap the nostalgic benefits of planting a food plot. I believe it’s the act of putting the seed in the soil, nurturing its growth and looking forward to the harvest that strikes a chord deep down in my soul. This summer I’ll do it all over again, with a twist. I get to break ground on a new plot on my family’s hunting land. My relatives weren’t pioneers, at least not in the covered wagons and Oregon Trail sense of the word. But as I work to topple trees, dig rocks and sow the seeds, I’ll be reminded of farmers and pioneers in the past. Having grown up in rural Wisconsin, the smell of freshly tilled earth is nothing short of cathartic. Although I can imagine how a hunter who's holed up in the concrete jungle Monday through Friday may appreciate it a bit more. Next time you fire up your tractor, UTV or even walk-behind tiller to begin the process of putting seed to soil, stop a second to think about farmers that came before you and maybe worked that same ground. Then get to planting.